Where do you start with mobile apps for business? Preparing a mobility strategy is the first step. Thinking through a strategy will identify areas of business activity where mobility can provide improved productivity and/or reduced cost. A strategy will also help to allocate priorities so that the company implements mobility solutions that provide the optimum return on investment. Mobile apps built using LongRange can use storage on a mobile device and operate online when connected to a network, or offline when no network is available. You can use these features to streamline business processes that use data when employees can't connect to a corporate or public network. Your mobile workforce need not suffer reduced productivity when communications are unavailable. This section suggests business processes and activities that can benefit from mobile apps. Order inquiries to view open orders, closed orders, delivery status, stock item availability, pricing and discounts. Purchase order tasks including: create purchase orders, review purchase orders awaiting approval, add comments and instructions, and approve or reject purchase orders. Business intelligence inquiries based on real-time data. Expense claim tasks include entering expenses, submitting expense claims for approval, and managers approving or questioning a claim. Requisitions: preparation, submitting, approval and fulfilment. Why do you need apps for mobile devices? Mobility means access to information at any time from anywhere. It has added an extra dimension to working time and provides customers, partners and suppliers with flexibility in corporate relations, cooperation and collaboration. The expansion of mobile device capabilities and the introduction of tablets represent one of the fastest innovations in information technology. Its speed of adoption and global spread, has transformed behavior and expectations of business and consumer users. The pervasiveness of mobile devices has changed the way companies interact with customers and provide information to employees. Customers expect to conduct business with companies from their mobile devices, at any time and from anywhere. Many employees don't want to carry personal and company supplied mobile devices, preferring to use their own devices as part of their working environment. 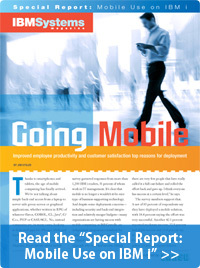 Companies can boost employee productivity by providing mobile devices or allowing employees to bring their own devices. People take their mobile devices everywhere they go and are comfortable interacting with the device for email, social networks, music and messaging. Employees can use idle time, such as waiting in an airport lounge, to check email or access corporate data. Responding to a customer question or tracking a customer's order is faster when an employee has access to information at any time. Similarly, companies can improve customer relationships by granting access to product information and ordering from mobile devices. Customers can browse product catalogues and purchase products at their convenience. The catch - companies need mobile apps to make this a reality. LANSA built LongRange to enable the IBM i (System i, iSeries, AS/400) developer community to make apps available to mobile device users quickly and with minimal developers effort. Apps built using LongRange easily integrate with existing applications and business processes. They are inexpensive because developers are productive immediately. Many companies lack the skills and resources to embark on a project to build and deploy apps for mobile devices. Developers with experience in building line-of-business (LOB) applications face a paradigm shift in the architecture, design concepts and development tools used for mobile device apps. LongRange is a fast-track for transforming IBM i developers into mobile app builders. Websites viewed with a browser on a mobile device. Websites optimized for viewing with a browser on a mobile device. Native mobile apps built using LongRange. Each option requires time and effort to build and provides differing levels of user experience such as ease-of-use and performance. 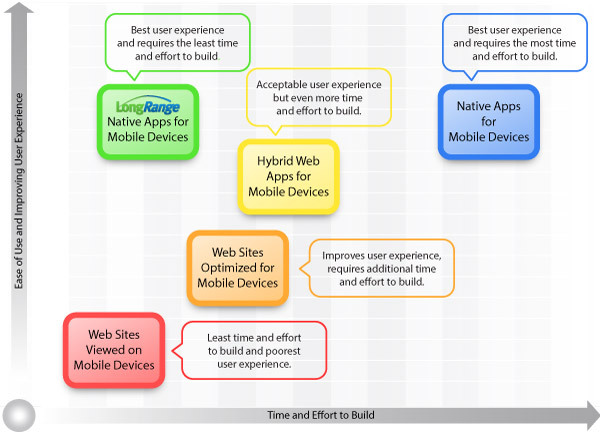 Consider a comparison of different types of mobile device apps where the horizontal axis shows time and effort to build and the vertical axis shows the user's perspective of ease-of-use and fast interaction with an app on a mobile device. Native apps provide the best ease-of-use, performance and user experience. However, building native apps takes longer than the other options. Developers use device specific tools (such as C#, Java and Objective-C) and must build an app for each mobile platform (such as Apple iOS, Google Android, RIM Blackberry and/or Microsoft Windows Phone) companies wish to support. LongRange allows developers to build native apps for multiple mobile platforms using their existing development tools and skills making them productive immediately. The LongRange mobile app development tool encourages results oriented programming as it allows developers to concentrate on business requirements and not mobile device technology. This means that the total-cost-of-ownership for a mobile app becomes a viable proposition, especially for companies without any previous experience in developing mobile apps for business. No new skills required - you only need RPG, COBOL or CL, and you are already an expert with these! Use RPG, COBOL or CL on the server; no programming is required for the mobile device. The same RPG, COBOL or CL programs will service iOS, Android and Windows tablets and PCs. The user interface of the native app automatically reshapes and resizes to accommodate different screen sizes (e.g. smart phones versus tablets). There is no additional cost of hiring, training and retaining developers with specialized mobile app development skills. You only need to maintain one set of RPG, COBOL or CL source code to support multiple mobile platforms. Rapid return on investment – quickly deliver easy-to-use native mobile apps with a rich user interface and enhance your users' productivity. Reduced ongoing maintenance costs – No need to develop multiple versions of programs to support each mobile device platform or to use complex cross-platform tools to convert programs. Minimal developer learning curve – no need to learn mobile specific programming. 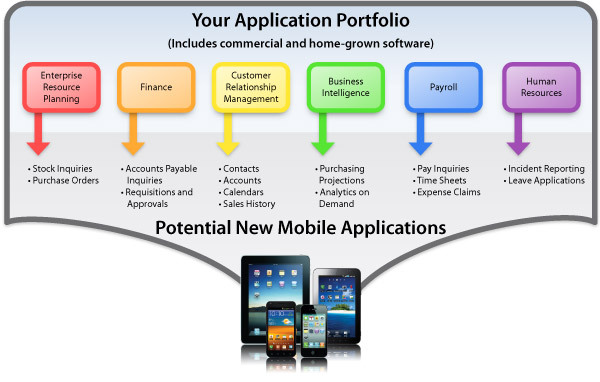 Using LongRange mobile app development software, companies develop and deploy apps for mobile devices quickly. The time-to-market is short as development is incremental and evolutionary. JPMorgan Chase The Chase banking app lets customers deposit checks via a snapshot and sent via email. Walgreens Walgreens delivers what their mobile users want on their mobile site: the ability to find nearby stores, refill prescription, do mobile shopping and get coupons. As a result, Walgreens now completes a significant percentage of all prescription refills via mobile, more than two million people receive text alerts, and customers can scan for coupons inside the store. Wal-Mart The Wal-Mart app allows users to add shopping list items by speaking, typing or barcode scanning. The app also shows prices, availability in local stores and, in select markets, even display which aisle the product is located. LongRange is applicable to any business activity that users wish to access from a mobile device. The following business activities, processes and administrative tasks are candidates for use on mobile devices. Asset management During an asset management audit, an auditor can visit each asset, scan the asset barcode (thereby confirming that the asset exists), update location and user information and make notes about the physical condition of the asset. Consulting Consulting company employees at customer sites can access product and marketing information and procedures manuals. They can access employee services including preparing and submitting expense claims, posting time sheets and lodging leave applications. Delivery and distribution A mobile app can provide access to information about deliveries, routes, customer details. Drivers accept electronic signatures and post delivery reports. Using a mobile device with LongRange removes the need for dedicated delivery devices in delivery vehicles. Insurance claims Insurance claim assessors can use a LongRange app on a mobile device to gather information when assessing a claim. For example take photos of the situation, record customer data (such as policy number and phone numbers), make notes about the assessment and upload the information to a corporate server. They can also access employee services including, preparing and submitting expense claims and lodging leave applications. Pharmaceutical company representatives A representative can visit a pharmacy, perform a stocktake, derive a suggested order, check stock availability, review and amend the order with the store manager, place the confirmed order and update information in the customer relationship management system (CRM). They can access employee services including preparing and submitting expense claims, checking pharmacy visit schedules and lodging leave applications. Repairs and maintenance Repair and maintenance staff can look up (and optionally download) product repair instructions and diagrams. They can use the camera to take photos of a broken device, upload the photos, request assistance and advice about how best to make the repairs. They can access employee services including checking their schedule of visits and lodging leave applications. Retail Sales assistants can carry a tablet (or smart phone) and access information such as stock availability and prices while standing next to a potential customer. They can access employee services including checking rosters and lodging leave applications. Sales Company representatives visiting customers can access product information, check stock availability, place orders and update CRM information. They can access employee services including, preparing and submitting expense claims and lodging leave applications. Warehouse Using a tablet employees are no longer tied to a desktop computer in a fixed location and tablets are easier to manage than notebook or ultra-book computers. They can access delivery schedules for incoming and outgoing products, and perform a stocktake with freedom to move around the warehouse. They can access employee services including checking rosters, posting time sheets and lodging leave applications. You need LongRange for LANSA to build mobile apps using your LANSA skills. Learn how LongRange can be used to build mobile device apps using only IBM i developer skills. Understand why your company needs mobile apps, learn how to prepare a mobile strategy and identify business processes suitable for mobilization.